Good luck on your ride Saturday! Sounds interesting. Love to come, but I am on another continent! Too bad Mark and Danny couldn't have scheduled their ride for Sunday. It would have been a good combo; see the good on Saturday, the bad on Sunday. 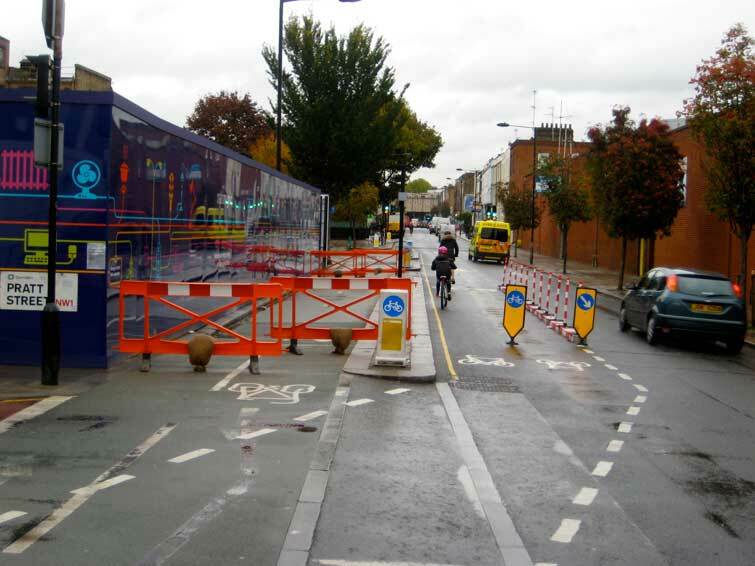 "Back in Camden, I saw, and perhaps this is the first time this has ever occurred in British history, proper measures to divert and keep protected a cycle route when the usual route is closed by building work." It took the construction company (¿or Camden?) a good few months to put this in, with the obligatory "Cyclists Dismount" signs in place all that while. Okay going North, but Southbound you were left in the lurch. They put the diversion in over the week of my viva, the last week I needed to take this route. I attempted to take my bike out for the first time in Brent last Sunday, and if moving house hadn't wrecked my front dérailleur I would be joining you on Saturday. The main cause for optimism in November is that the nights start getting lighter next month.